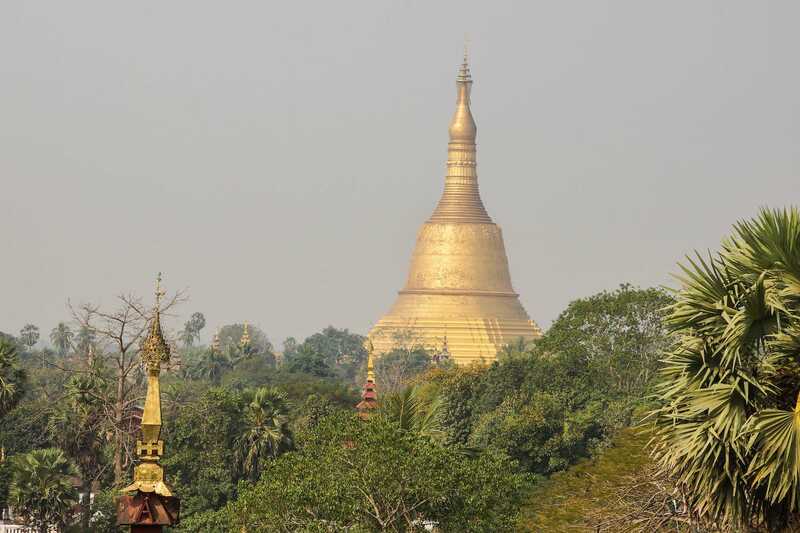 According to Buddhist legend, the newly enlightened Siddhartha Gautama made a flying trip to Lower Burma, which at that time was covered by sea water. Seeing a female hamsa sitting on the back of a male, perched on a tiny island of dry land, Buddha foretold that this spot would become the centre of a prosperous kingdom 1500 years later. 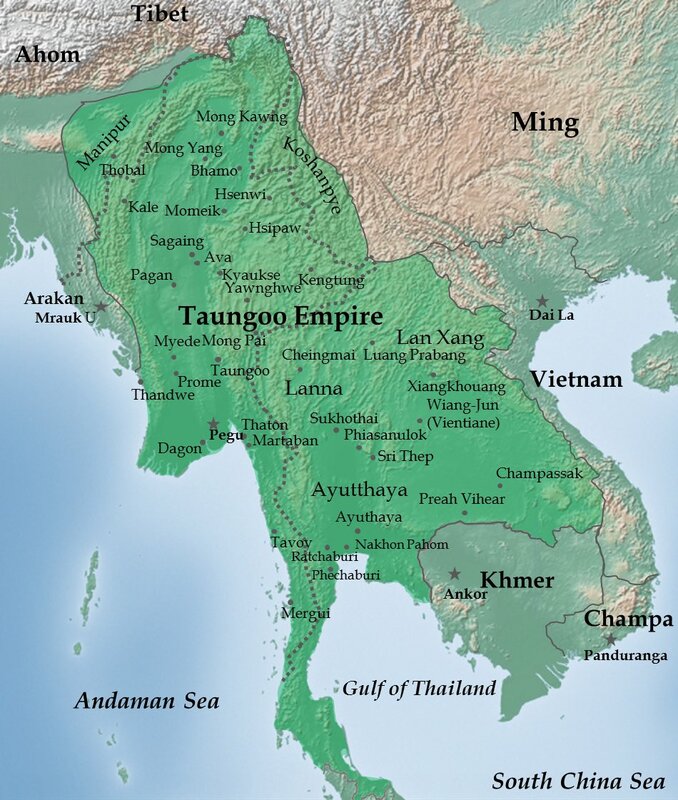 Roughly on schedule, the waters having receded, two Mon princes founded the town, known as Hanthawaddy to the Mon, in 825 AD. 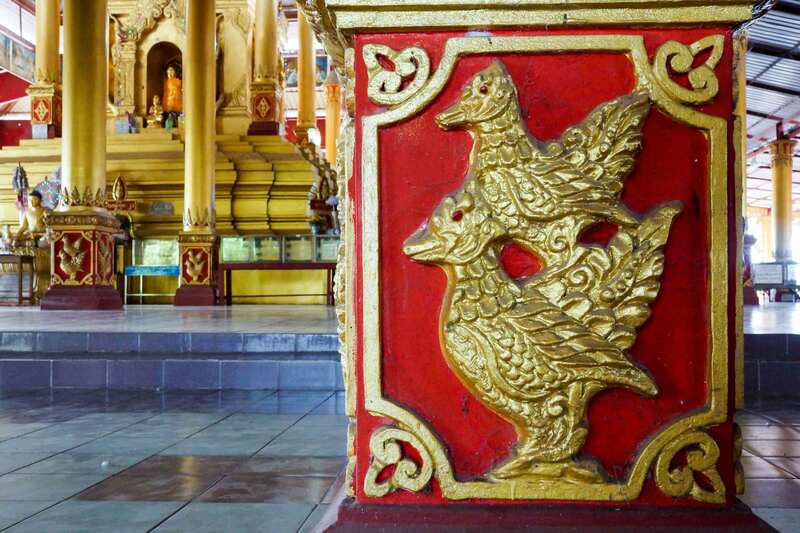 The double hamsa motif can be seen all over Bago today. 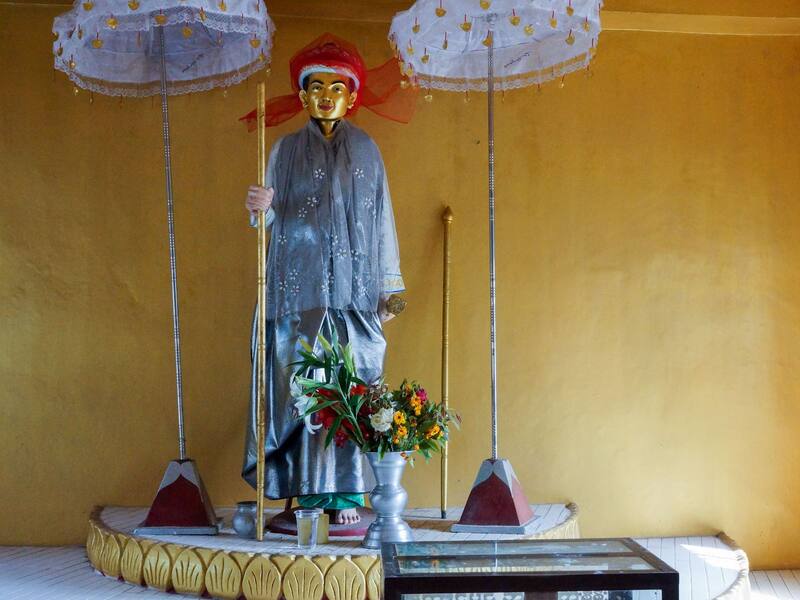 Given that Bago is about a mere 18 meters above sea level it is possible that the legend echoes faint memories of a severe flood which affected the area before the ninth century foundation of the city. 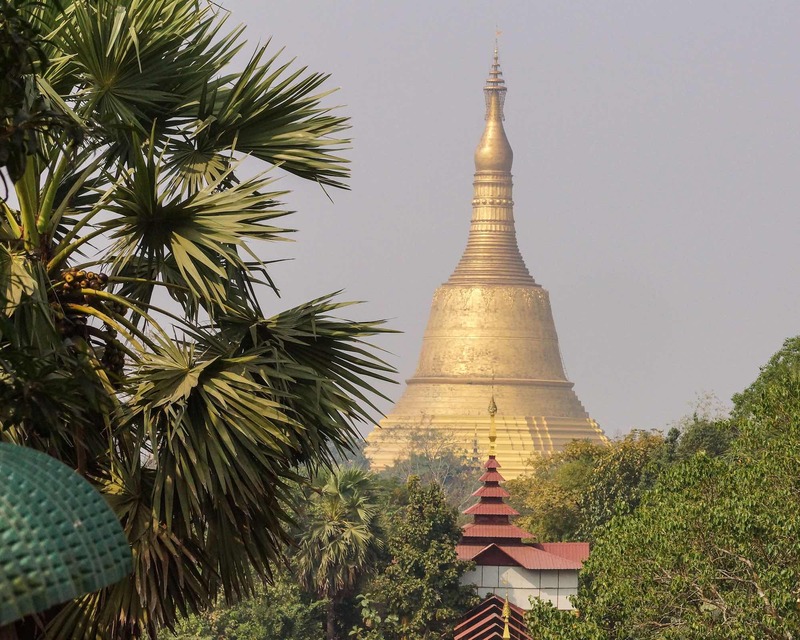 To connect one’s city or stupa with the Buddha’s life in some way can never be a bad thing in Myanmar! 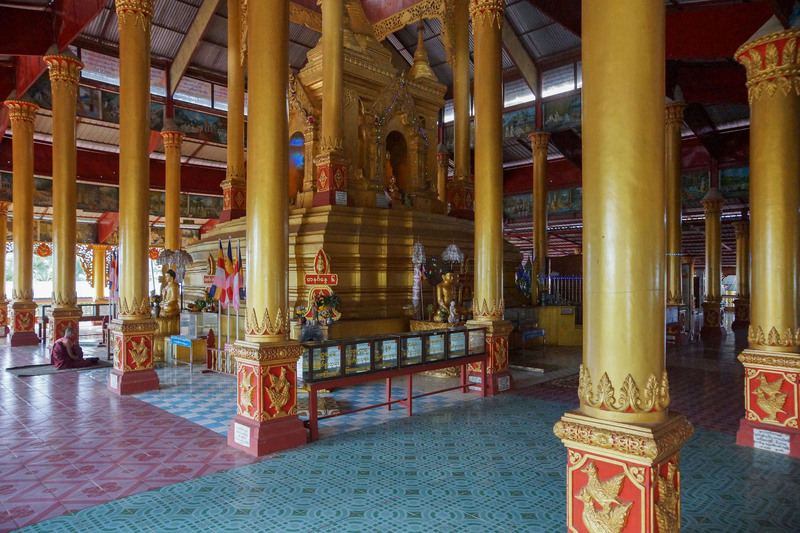 The temple on the hilltop was restored in the early 20th century on the inspiration – and money collecting – of the Buddhist monk U Khanti, who is also credited with restoring the various temples on the top of Mandalay Hill. Since that time the earthquakes of 1917 and 1930 that levelled the stupa down below undoubtedly had the same effect on the structures of Hintha Gon, whose large central shrine is covered with a column-supported and modern-looking roof steel girders and aluminum sheeting. As the pix above and below show, the hamsa image is a recurring one! There really is not a lot to see here other than the central shrine. 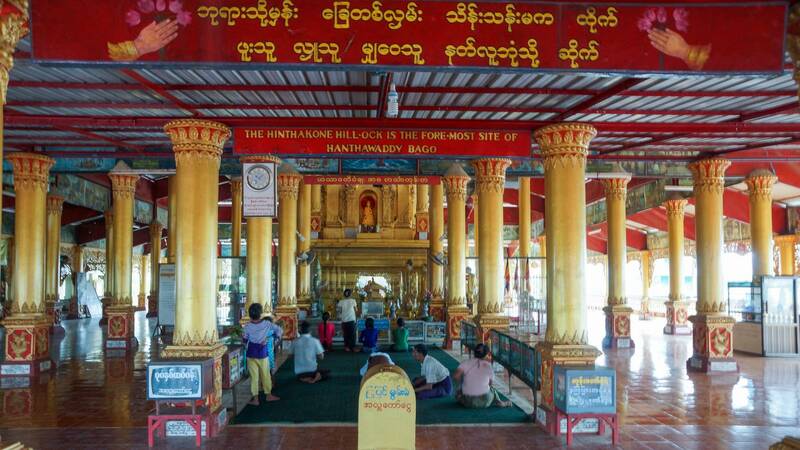 Some guide-books refer to the temple as a major nat worship site but, given my lack of knowledge about this dimension of Myanmar religion, I did not recognize much of it as I wandered around. I am hard pressed to explain the significance of the figures in the two following images. 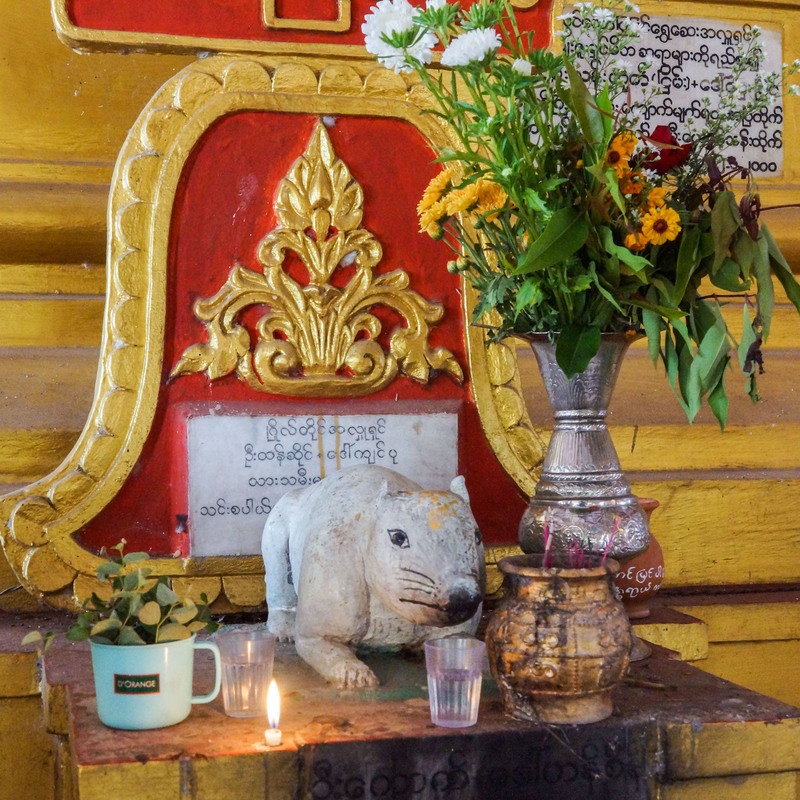 If the shrine is one of the eight planetary posts common in other Myanmar temples, the mouse may be associated with one of the days of the week (Thursday). However, I did not see the elaborate shrines associated with the eight days as I made my way around so it probably is a reference to some other legend. what is a mouse doing on the Hintha Gon shrine table? The figure below I take to be a nat figure. Nat worship is an important element of the animistic religion of the Bamars before they took on Theravada Buddhism some thousand years ago. 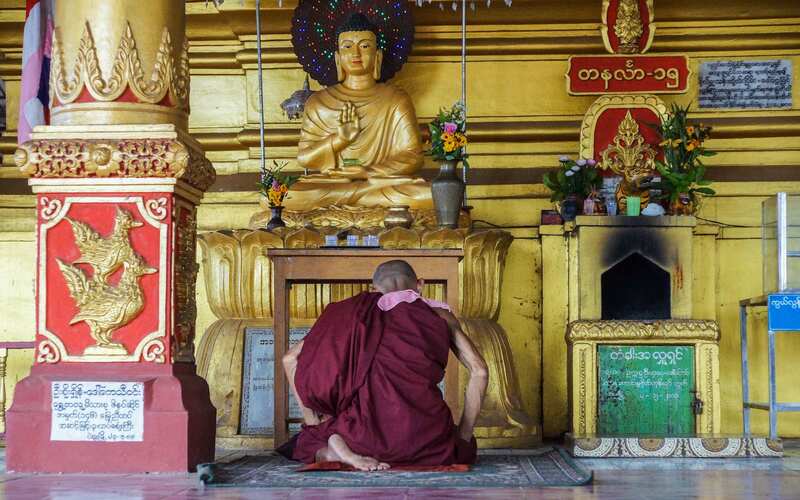 As in Tibet with the Bon religion, many of the Bamars’ pre-Buddhist beliefs were integrated with their new religion. 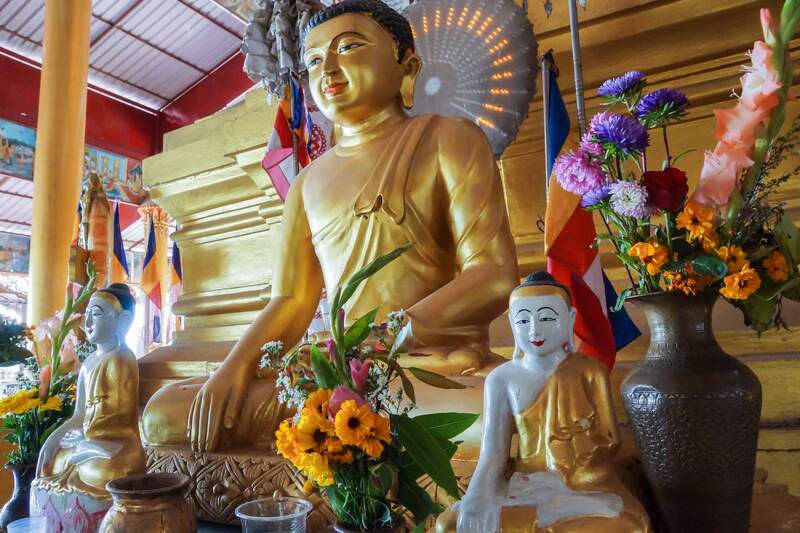 The result is a head-scratching experience for someone like me whose Buddhism is essentially a demythologized and heavily secularized version of what real Buddhists in Asia actually practise. The nat pantheon consists of thirty-seven established major nats and a myriad of other minor nature spirits. My research into the various nats did not turn up anyone depicted in the way the figure below is. Please comment below if you know! The biggest reason for visiting Hintha Gon, other than to stand at the mythic foundation spot of what for a short while was an important city, is to see the view of the modern city to the west. Standing above all else is the Shwemawdaw, visible in the photo below on a hazy weekday morning. I returned to the car and my driver Wan after passing by vendors’ stalls with temple flower offerings and other items for sale. 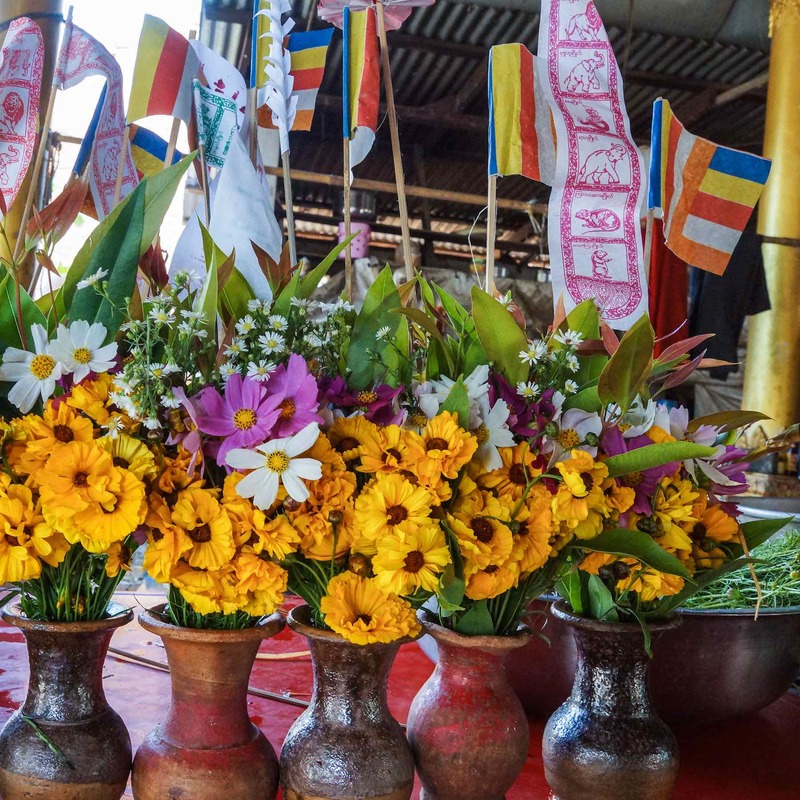 The red and white banners depict the animals associated with the eight days of the week in Bamar astrology – Sunday’s Garuda and then the tiger, lion, tusk elephant, dragon, tuskless elephant, mouse, and guinea pig. Also hanging there were a few multi-coloured Buddhist flags with a pattern created in the 1880’s by Henry SteelAlcott off the Theosophical Society and since adopted by Asian Buddhists as one of their symbols. Perhaps you know the significance of the horse-like creature below? If so, let me know. There must be a reason why they would be in a shop attached to the Hintha Gon temple! 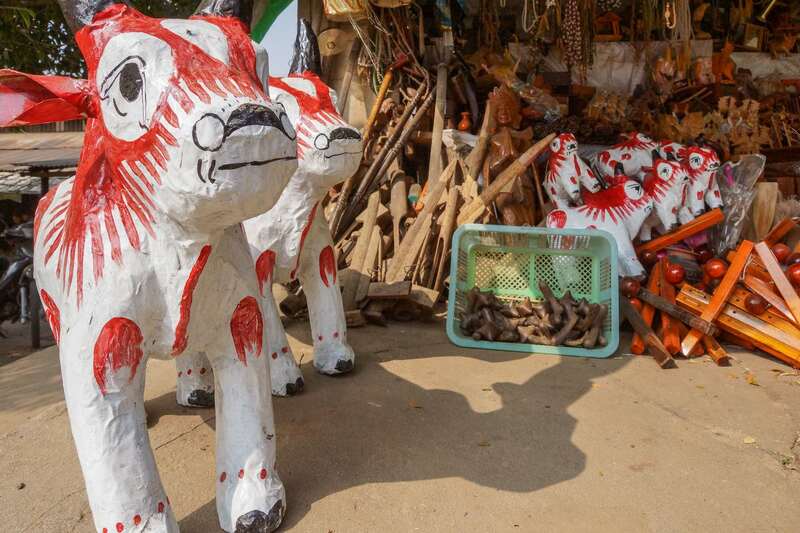 Hi, the papier mache animals are actually buffalo, while they are sold as children’s toys, they are also representative of the Buffalo Mother nat Nan Karine Medaw. 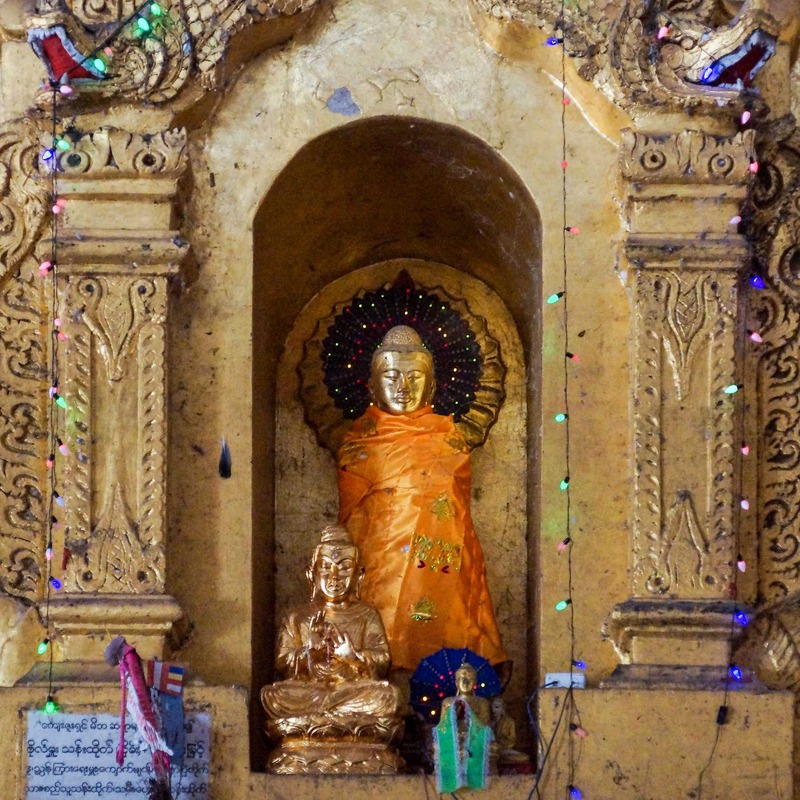 There is a fairly significant shrine to her at Hintha Gon Pagoda. 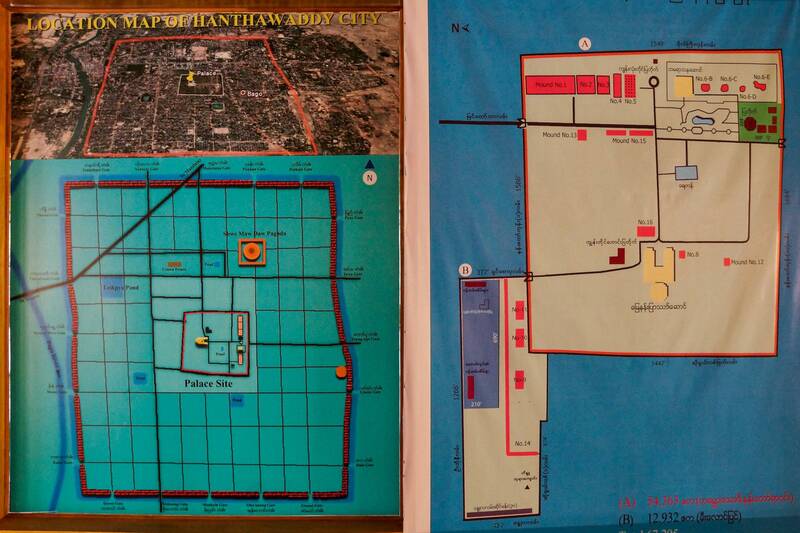 The above information boards give the visitor with a bit of back ground to the rule of Bayinnaung and the site plan for the city of Hamsawaddi Pegu. 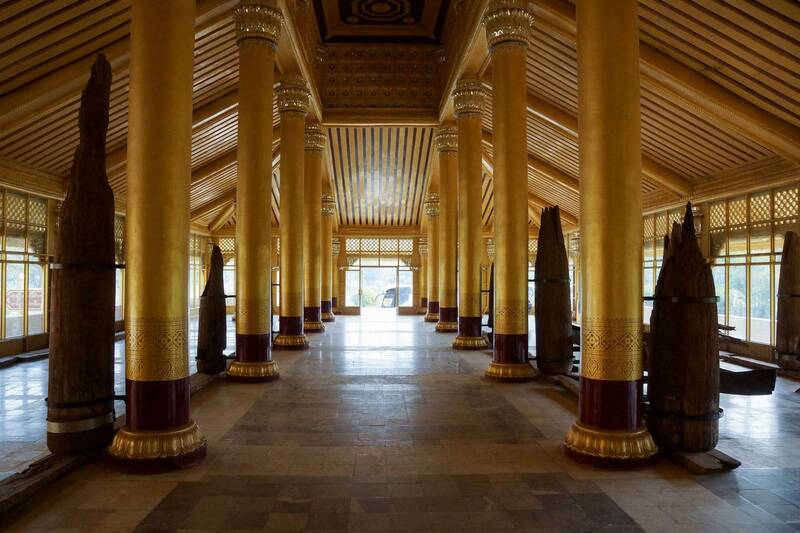 The Palace itself is in a U shape with two long wings and the central area with the Lion Throne Hall. One of the wings is depicted in the image below. It is important to note that the palace you see is a construction that went up in the 1990′ based on the evidence uncovered by archaeological work. 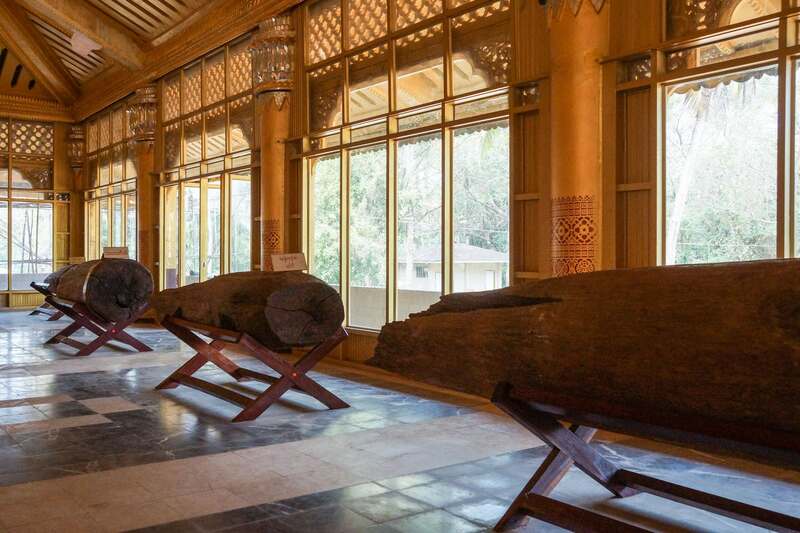 The remains of the original wooden posts were the main element uncovered. 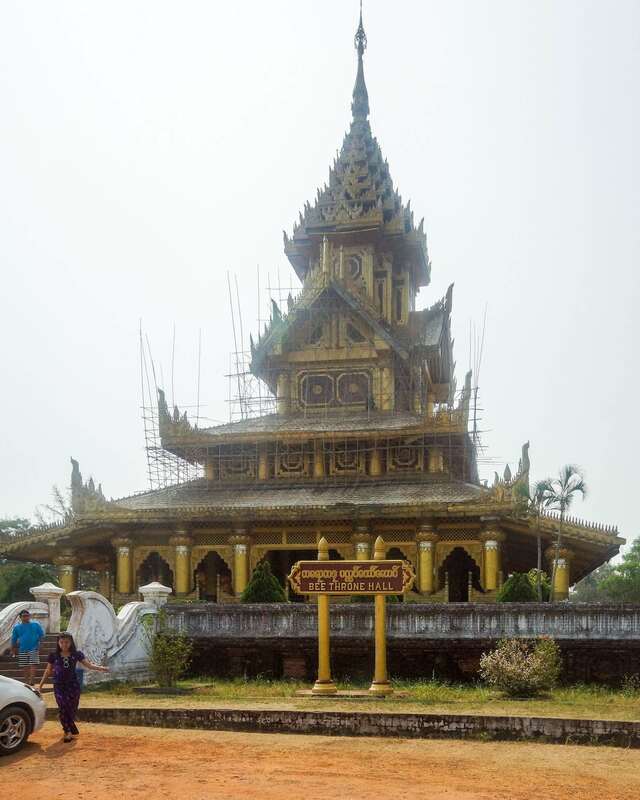 While the recreated palace does raise questions about authenticity and accuracy, it is now another site on Bago’s tourist tour route! The ruler who commissioned the building of the palace is the middle of the three figures pictured below. 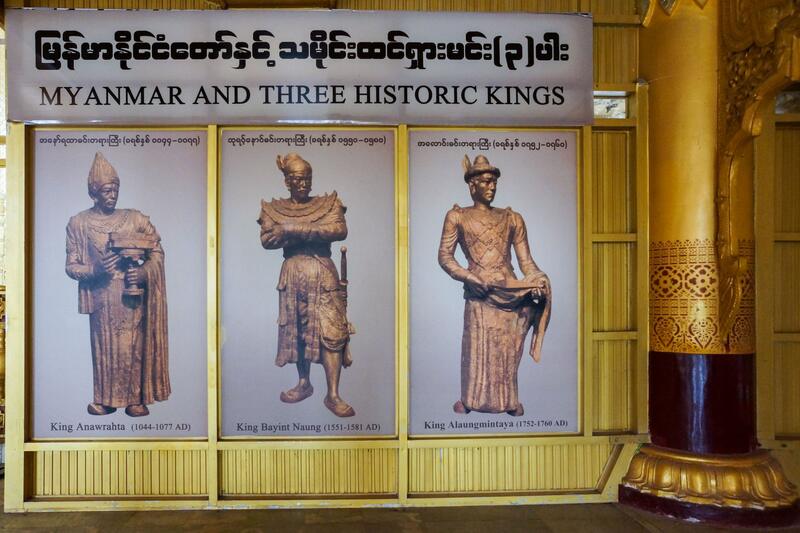 On our left is Anawrahta, the founder of the first great Bamar Kingdom after 1044 C.E. it was centered in Bagan (aka Pagan). 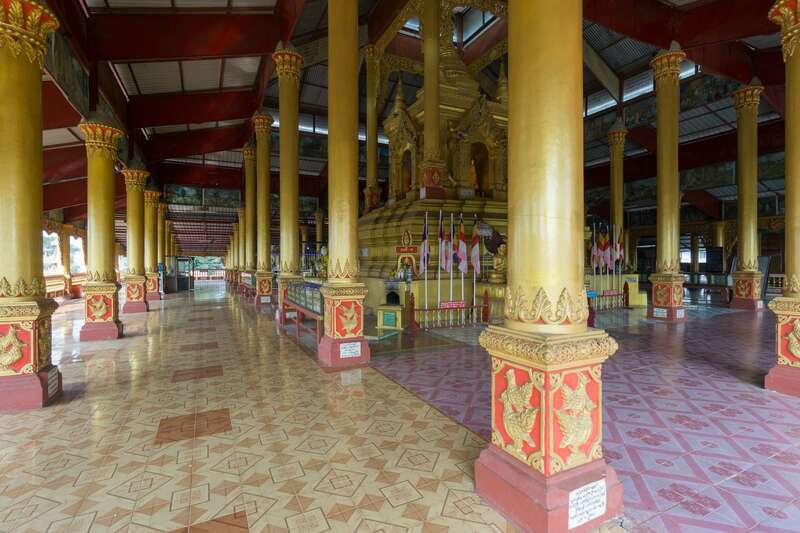 Alaungpaya is the third monarch; he founded the last of Burma’s great dynasties, the Konbaung, in the mid-1700’s. What all three have in common is their consolidation of power over the area we still think of as Myanmar these days. 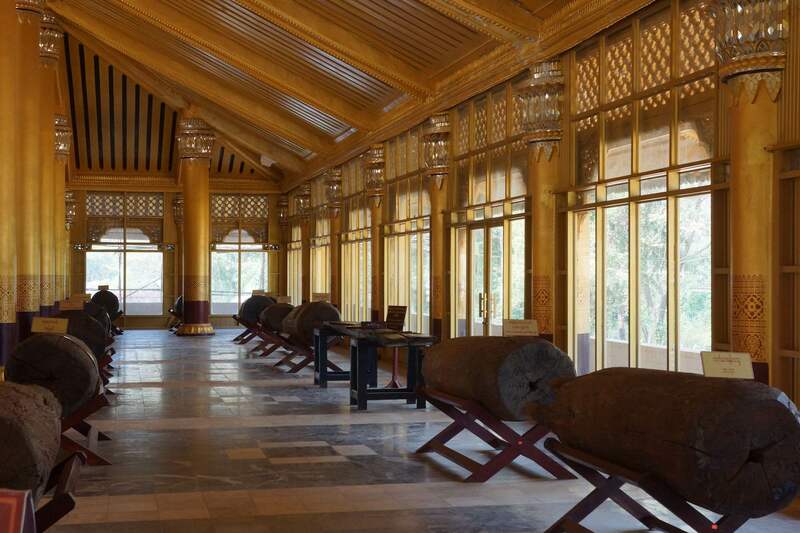 This may explain why the military rulers invested in the construction of this palace; faced with ethnic insurgencies around the perimeter of the country, the building is an re-affirmation of Bamar hegemony over the Myanmar of these three lionized kings. 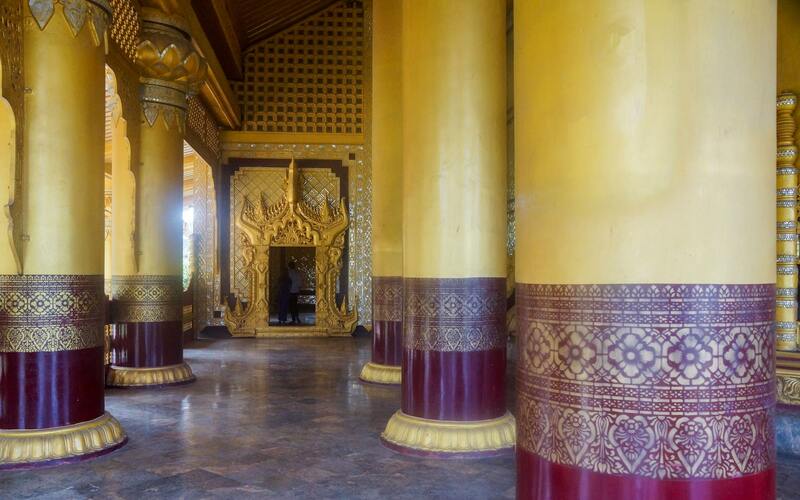 The capital of this territory – today’s Myanmar and most of Thailand and Laos – was Pegu. 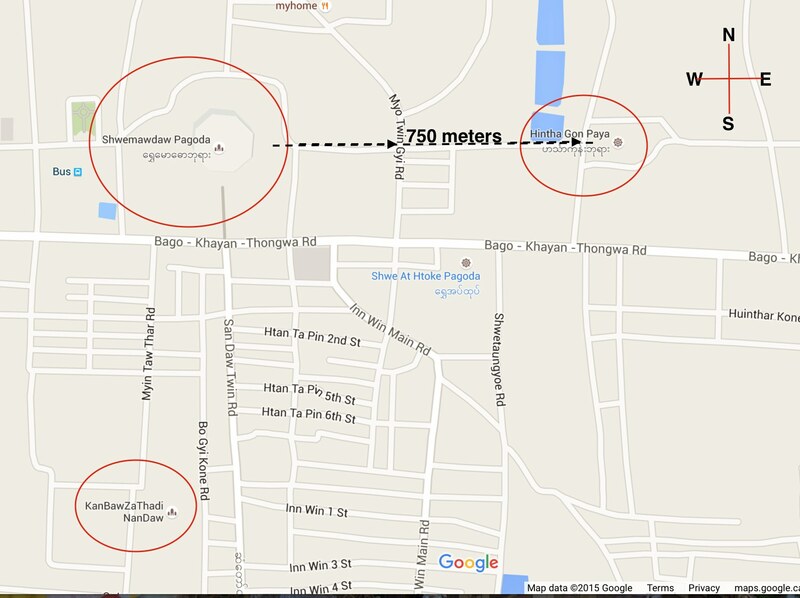 It was to Pegu that emissaries would come from all corners of his empire to pay homage and seek favour. 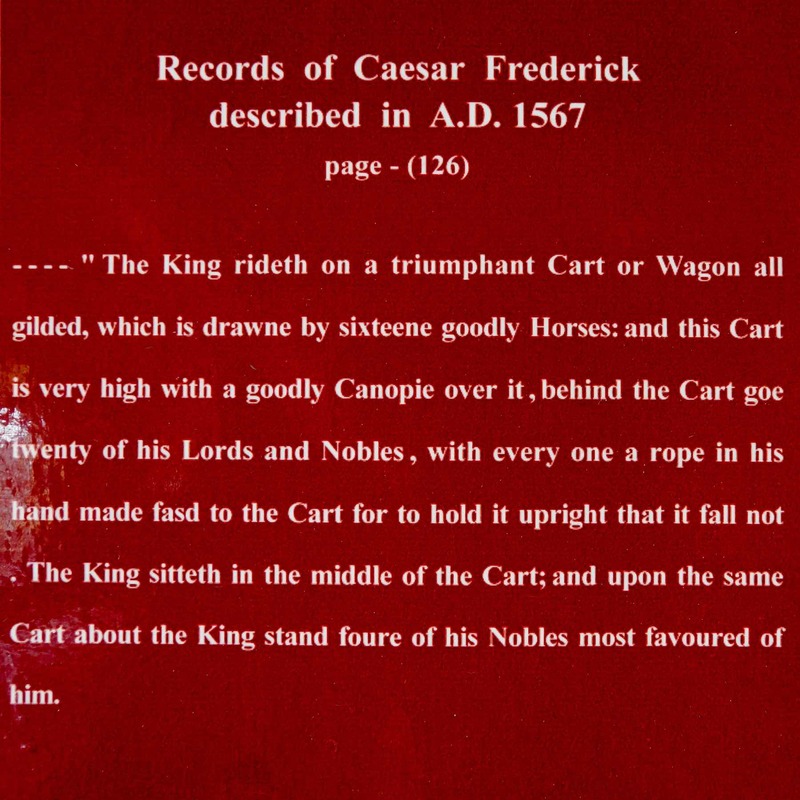 The carriage below is meant to convey some of the grandeur of those times – although it seems -like a scaled-down version of the grand vehicle described by a visiting European in 1567.
description of Bayinnaung’s carriage from 1567 C.E. 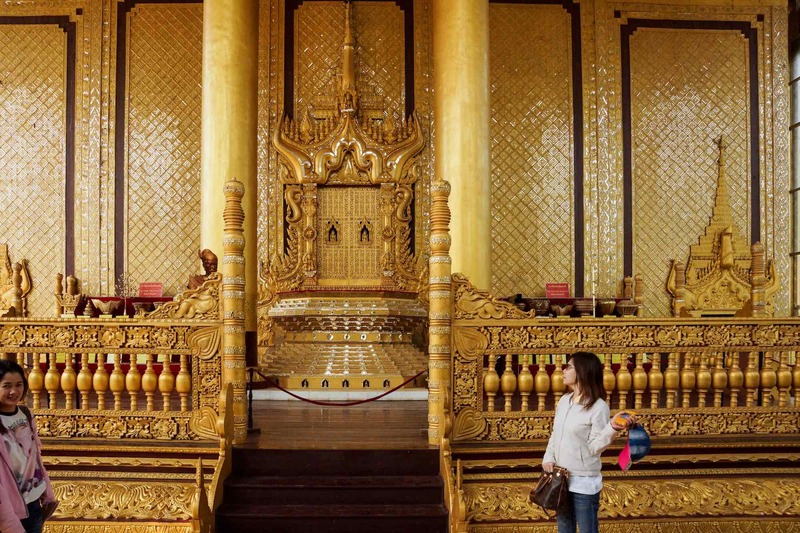 The focal point of the palace is the Lion’s throne Hall. 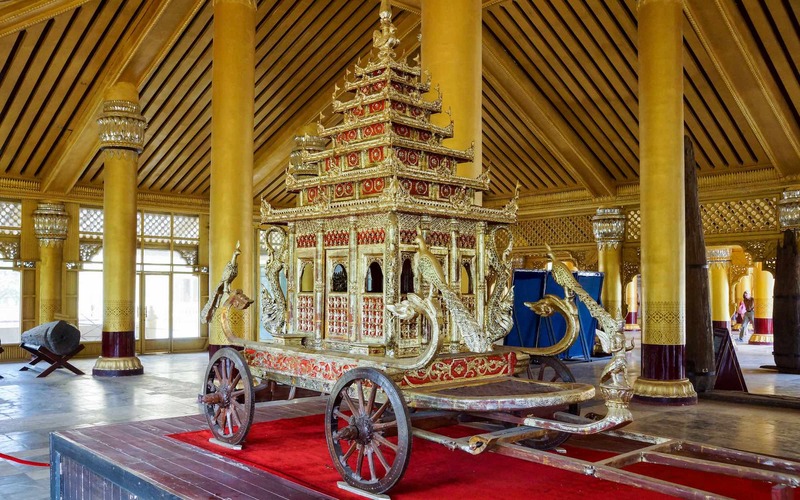 Instead of the gold-coloured paint we see now, it is probable that real gold – and lots of it – was used to convey the might and power of the Taungoo Dynasty. 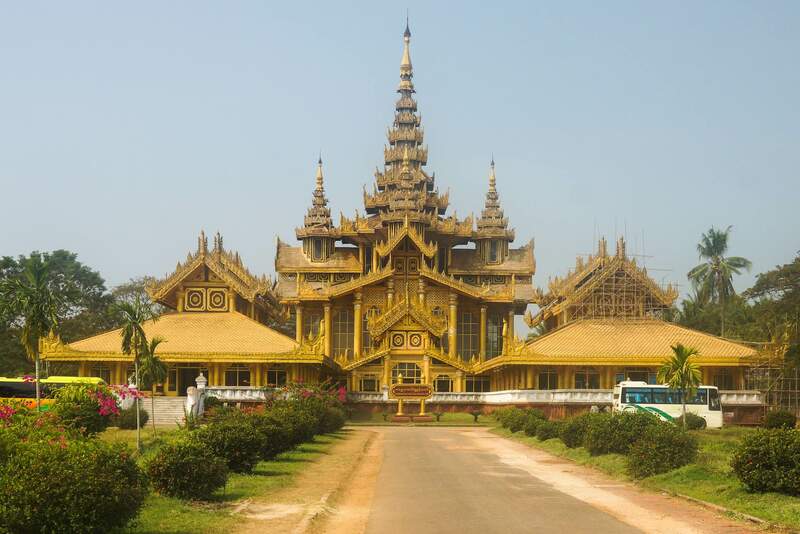 Unfortunately, it was destroyed within twenty years of Baybnnaung’s death in 1581, and was only recreated in the 1990’s. There is not really a lot to see at Kanbawzathadi Palace. 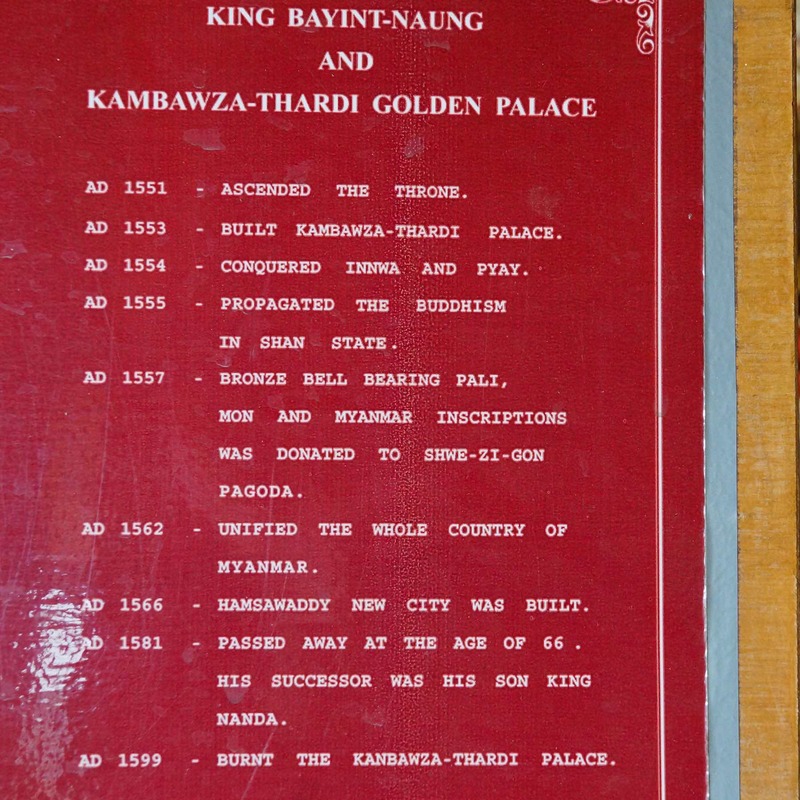 Perhaps in time, the available space will be used to flesh out the details of Bayinnaung’s reign and its accomplishments with more displays of artifacts from his time. Twenty minutes was all it took to see everything. On our way to a cup of coffee Wan did stop in front of the Bee Throne Hall; like the Palace, it is a recent reconstruction. 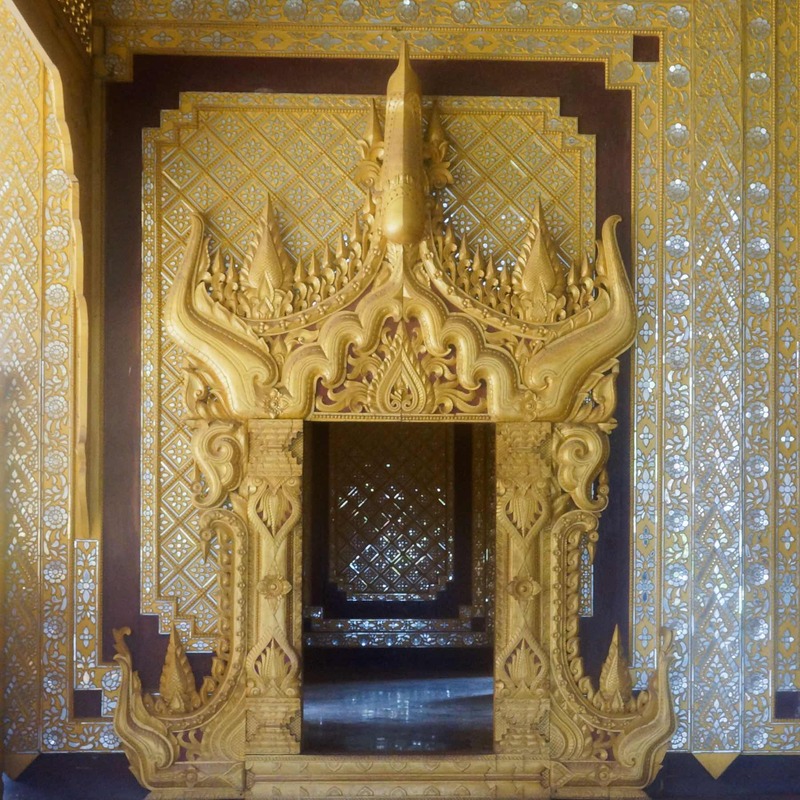 It was apparently the King’s private quarters and contained a living area as well as his bed chamber. You really don’t get a sense of any of this as you walk around the parts accessible to public viewing. Over time if the motivation is there to devote scarce resources to the project as opposed to more mundane ones like new schools and hospitals and better pay for teachers and nurses, perhaps more of the palace complex will be excavated and reconstructed. 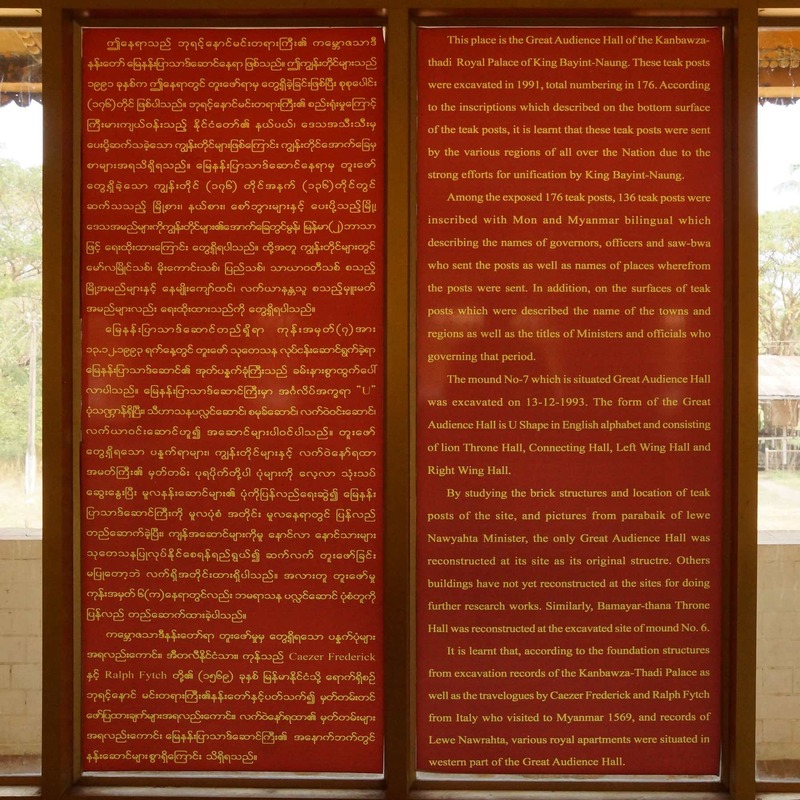 If nothing else, it sends a positive message to the young of Myanmar that their ancestors did great things – and that they can too if they work to keep the country unified. Keziah, thanks for the clarification! Knowing the story behind the object always adds to the experience. I’ll look at those water buffalo differently now! It certainly does! Glad my comment was helpful.